Uh oh... Its that dreaded time of year again - Halloween! I hate it. So far we've had none of the little s**ts knocking on our door yet - That might have something to do with the big sign that I have attached to our front door telling people to (basically) piss off and not knock!! 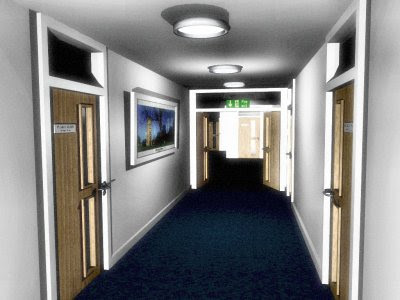 Anyway, I've been busy working on another 3D render - Here's an early shot. Its not quite finished yet, but it's coming along rather nicely. I still need to finalise the lighting and add some furniture and things just to spruce it up a little bit. And finally... Many years ago (1999 or 2000 I think), I watched a really good program on Channel 4 called Spaced. I usually hate sitcoms, but this show was different. I loved all the references to Sci-Fi, computer games etc. Not only that but it also stars one of my favourite actors, the fantastic Simon Pegg (who just so happens to be Star Trek's new Mr Scott in the forthcoming Star Trek movie). Anyway, I decided a couple of days ago to order the complete boxset from Amazon and it arrived in the post this morning. Now I can't wait until the weekend when I will be able to sit down and watch every episode in one sitting..... Yeah... I'm sad I know!! One last thing before I go.... Here's a nice panoramic image that I took with my camera for you to admire. I took when we visited Essex last week. We decided to pop down to my old home in Laindon for a few days this week (We came on Sunday and are returning home to Evesham tomorrow), and although we've had a nice break, I would just like to say how arrogant, and horrible some of the people from the area have become. To those of you who have pissed me off (and especially that silly brat who decided to call Kieran a c**t for no apparent reason while her mum (a typical essex single Mum in her tracksuit, talking on her mobile) just ignored the whole thing...... UP YOURS!!. 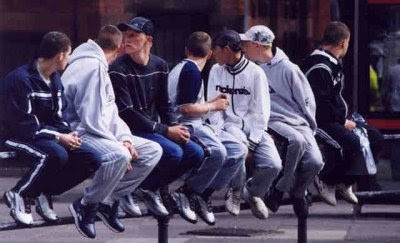 Has Basildon become the Chav capital of Great Britain since I moved away in 2002? Can't wait to go home now back to the country! Note to Dan *** Sorry mate that we couldn't meet up while we were down visiting. I did try ringing your phone a few times, but I couldn't get through. .... So why is it that some of these 'professionals' have little or no computer knowledge whatsoever. I'm talking about a teacher who has to ring for technical assistance because they can't start their computer only to find that it just isn't plugged in at the mains, or a teacher who can't log on to the internet because he is trying to log on using the wrong username (even though they have been using the same username for the past couple of years). I've come to the conclusion that all teachers should now have some sort of basic IT training because even though they may have the degrees, and the certificates to prove that they can teach, they simply can not work the simple things, which I hate to say, can be done by almost anybody these days. Come on..... this is the 21st century - todays children are tomorrow's workers. Most will end up working in an environment which requires them to have some sort of contact with computers and technology. How will they be able to do that when the people who teach them can not even switch on a computer, or even copy and paste a file in Windows. I taught myself everything I know about computers, from the first day I touched a computer in the early 1980's to today ; How to build them, how to program them, to develop and code a website using HTML, programming (Visual Basic and other languages), networking, 3d CGI graphics, video and audio editing. I never went to university after school (simply because I just couldnt afford it). Not wanting to sound big-headed, but I know more about computers than anybody in the school where I work, and yet because I lack that piece of paper saying that I have a degree, I end up not being able to earn as much as someone who say has got a higher qualification. Why should I have to pay just to do an adult course (ie Open University), so that I can learn stuff that I already know. The wage divide between University graduates and 'common' school leavers like myself is discrimination - having a degree doesnt necessarily mean that that person is better at a particular job. I'm constantly told at school by the teachers that I would make a really good IT teacher. Unfortunatly without a degree, that'll never happen. Fair enough, I could never teach a subject like Modern Languages, Maths, or English without having to study those subjects at a greater level than those I did at school, but my experience, and knowledge far surpasses a lot of the teachers at my school in regards to computers. Personal experience and development will always beat qualifications. I thought all of my visitors (well, all one or two of them) might like to listen to an early version of a song that I am working on. I've titled it simply 'Dreams', and I think it would sound great with some lyrics and some awesome vocals and chords, but I guess that will never happen. 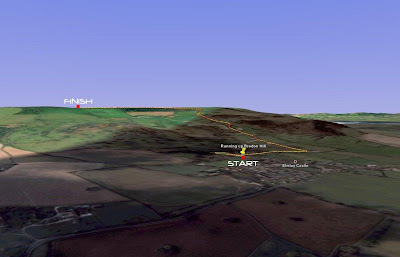 As part of my 'Get Fit & Healthy' regime, I've just been out for a run up a nearby hill here in Evesham called Bredon Hill. 4.08 miles of gruelling climbing and muddy terrain! Do I feel better for it...... I'll tell you when I've had a bath and a long rest!!! 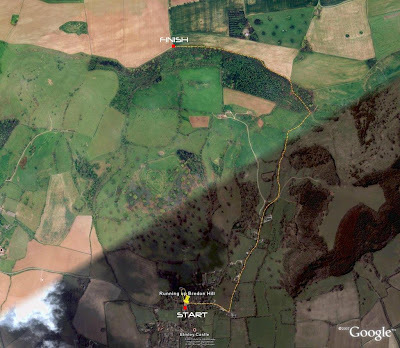 Click on the images for a bigger, more detailed view of the route. Haven't had too much time lately to work on it. The existing cabling for the joystick and buttons was a bit shabby, (two actually came loose from the circuit board) so we've re-soldered the wires and it should be much better now with less of a chance for the wires to come loose again.